The Iraq Papers will be the most comprehensive and best-organized document collection of America's misadventure in Iraq. The editors have organized the book around the concept of pre-emption, a policy that represented a significant break with past American foreign policy. The editors locate the intellectual origins of pre-emption in neoconservative writings from the early 1990s, and then trace how the logic of pre-emption played out across a number ofarenas in the first decade of the twenty first century: the war itself, America's relationship with its allies and the UN, its dealings with Iraqi society and successive Iraqi governments after 2003, and domestic policy in the Bush-era United States. They close with a chapter on the limits of American policy asit moves into the Obama era. There are eleven chapters in total, and ten will feature a representative selection of the most important documents relating to the origins of the war-including prominent writings by early neoconservative advocates for invasion-and the war's impact on Iraq, America, and the world. 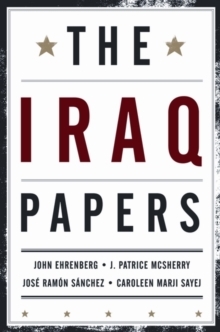 Covering more than a decade, The Iraq Papers will be a definitive source for anyone interested in understanding this enormously complicated and difficult conflict.